On April 5, 2012 the JOBS Act was signed into law by President Barack Obama. Sherwood Neiss, Karen Kerrigan, and Jason Best joined the President in the Rose Garden for the signing of this transformative legislation. 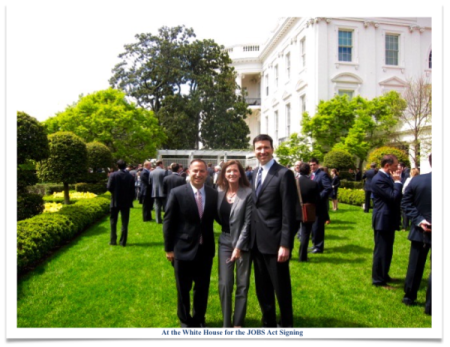 Washington, D.C.. – Four years ago today on April 5, 2012, President Obama signed the Jumpstart our Businesses Startup Act (JOBS Act) into law in the Rose Garden at the White House. The overwhelmingly bipartisan bill, which focused on stimulating the U.S. economy by promoting capital formation and private sector jobs, represented what is possible in Washington, D.C. when both parties get behind ideas that are good for the country. Four years later the final piece of the JOBS Act, “Title III” crowdfunding, will take effect on May 16, 2016. 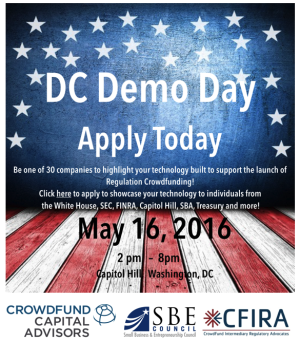 To commemorate the signing of the JOBS Act and the launch of this important milestone, the Small Business and Entrepreneurship Council (SBE Council), Crowdfund Capital Advisors (CCA) and Crowdfund Intermediary Regulatory Advocates (CFIRA) will host a Demo Day on May 16 to highlight the latest technology developments built to support this new, emerging market and how these innovations will bring transparency, accountability, efficiency, and capital across the ecosystem. The May 16th event will be held from 2:00 p.m. to 8:00 p.m. on Capitol Hill. Technology companies from five verticals will be highlighted. They are Crowdfunding Platforms and Secondary Market Companies, Trust and Transparency Companies, Data Analytic Companies, Payment Gateway providers and other service providers to issuers using this new form of fundraising. Companies that fit in any of the five verticals above that wish to apply to demo their product can submit their desire here. The genesis behind equity and debt-based crowdfunding is based on the reality that startups and small businesses need capital to survive, scale and hire. While access to capital has been a steadfast challenge for many small businesses, the financial crises and Great Recession made matters worse as capital became increasingly hard to access from institutional banks and traditional capital market players. The JOBS Act made changes to the securities laws, and new and innovative forms of finance – like debt and equity crowdfunding – have been made possible. The foundation of the Securities and Exchange Commission (SEC) was based on a policy of investor protection made at the time of the Great Depression, which makes little sense in our modern economy. The principle of investor protection remains very important, of course, but today our lives and business systems are being driven by technology. The private capital markets still remain an offline, bureaucratic, slow, opaque, and non-technology driven black hole. While implemented pieces of the JOBS Act have begun to change this, other important changes will occur in May. On May 16, 2016, Title III crowdfunding (regulation crowdfunding) goes into effect. This will allow any small business to borrow money or sell shares to the average American using crowdfunding websites that are regulated by the SEC. These small businesses will be able to raise up to $1M per year provided issuers pass a background check and provide disclosures for investors to review to make a buy decision. Issuers have a limited amount of time to hit their funding target and if they do not hit 100% of their goal, the money pledged by investors is returned to them from escrow. For the first time in 80 years, any American regardless of income or net worth can back an entrepreneur they know or idea they believe in. However they are capped at the amount of money they can risk based on how much they make or have in their savings. Crowdfund Capital Advisors is a global crowdfunding consulting and advisory firm founded by Jason Best and Sherwood Neiss, the leaders of the debt and equity crowdfunding movement. CCA provides comprehensive advisory solutions for both the public and private sector. They have worked with the SEC, FINRA, crowdfunding platforms and industry leaders on shaping crowdfunding policy. They have clients in 35 countries and work with a variety of groups from professional investors, crowdfunding platforms and professional services firms to governments and entrepreneurs. They are authors of the World Bank Report, Crowdfunding’s Potential for the Developing World, the top selling Amazon book on Investment based crowdfunding and creators of the online education series Success with Crowdfunding. For more information, please visit: www.crowdfundcapitaladvisors.com.